Swallow Boats has a great reputation for quality, both in their designs and construction. They were also very helpful and easy to deal with, so all these things attracted me to Swallow Boats. But it is the boat design that is most important and no-one in the UK is innovating like Swallow Boats to produce highly usable boats with minimal compromises. They are taking tried and tested principles and improving them, whereas so many boat builders are failing to do this. Why did you choose a Bay Raider Expedition as opposed to other boats on the market? The BayRaider Expedition is unmatched in the marketplace, providing a ease of use, performance and good looks without compromises. Its combination of large cockpit and very usable cabin, all in a 20’ boat, also makes it ideal to a very wide range of uses. All other boats we looked at were either less flexible in their potential uses, sailed less well, were harder to trailer-sail or just didn’t look as good. All of those factors are key to me and only Swallow Boats could meet them all without compromise. We trailer-sail the boat because this gives us flexible access to different sailing locations and also minimises costs. We mostly sail the Dorset coast but have a choice of slipways depending on our mood and the conditions. The boat has also been sailed in Cornwall and Scotland and was easily towed to those locations. The great thing about the BayRaider Expedition is that it lends itself to such a wide variety of sailing. Memorable experiences include sailing from Falmouth to the Helford river and seeing sunfish swimming beside us, while on days when we couldn’t get out to sea we are able to potter up wooded creaks. 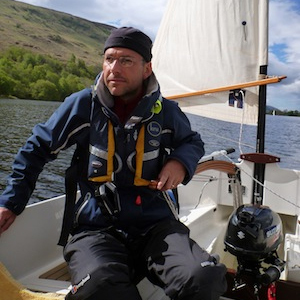 Most recently the boat took part in Sail Caledonia and it was fantastic to sail and row through the Scottish Highlands and be able to compete against boats that you would never take to sea with a young family on board. Very good. When we have had any problems or needed to discuss something it has been invaluable to be able to speak direct to the designer. I would definitely recommend Swallow Boats to other sailors and I am confident that if, in future, we decide to change our boat then we will look at the Swallow Boats’ range first.